About 2 weeks ago I was at the AC Food and Wine festival and I had the chance to stop by The Blues, Brews and BBQ. This past weekend I was craving that delicious pulled pork I had there. I figured I would give it a shot and try to make my own pulled pork. The turn out was a success. This is a must try recipe. The pulled pork is so full of flavor and when you mix it in with the homemade bbq sauce, it’s divine. Once you place it on a bun and top it with some homemade coleslaw, it’s heaven in your mouth. The hardest part about the whole thing was pulling the pork apart and not being able to stop picking at it (haha). Anyway I hope you enjoy this delicious sandwich. Mix all the ingredients in a large bowl, and set aside in refrigerator until ready for use. Place olive oil in medium saucepan and add onions and garlic cook until garlic is slightly brown (remember don’t over cook garlic it will get bitter) Then place the rest of the ingredients in and reduce heat to low simmer. Stirring frequently, for 1 hour to 1 1/2 hours. In a small bowl mix all the seasonings together. Rub them all over the pork shoulder. Now you can either cook it right away or let it sit with the rub for a couple of hours. Remember to let the meat sit at room temperature before cooking about 20 minutes. Take a large pot and add 2 tablespoons of Olive oil and begin to braise the shoulder (you’re looking for a nice golden brown crust). Once it’s all braised, add onions, celery, carrot, and water. (You should only have a peak of the shoulder sticking out). Taking the meat out of the liquid. Let the meat rest on a cutting board for 10 to 15 minutes before cutting through. I used 2 forks to pull the pork apart. Place the meat in the BBQ sauce or you can use it to drizzle instead. 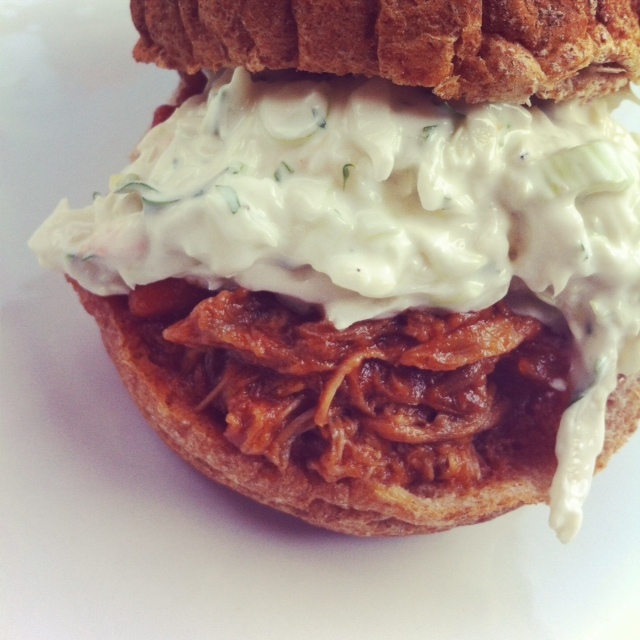 To serve, Cut buns in half and pile up some BBQ pulled pork. Top with a large spoonful of coleslaw and place the top half of the bun on top. Enjoy with a nice cold beer. Yumm. It’s time for dinner and I’m hungry so this looks especially good! The last instruction is key. Wow, that looks amazing! I made pulled pork a few weeks ago and I am desperate to make it again! Your comment about not being able to resist picking at the pork is so true – I feel like I ate an entire portion while I was pulling the pork!